Gold Seal-SaarGummi staffers with the Ford Q1 Award presented by Dheeraj Dixit, general manager, Ford India, Sanand Plant, at the GSSG Ahmedabad plant. Gold Seal-SaarGummi, the joint venture between Gold Seal of India and CQLT-SaarGummi of Germany formed in 1997, has received Ford Q1 certification, which designates the company as a preferred supplier and recognises the company for achieving excellence in four critical areas: capable systems, continuous improvement, ongoing performance and customer satisfaction. The company is now aggressively expanding manufacturing capacity to meet demand. The company is now setting up its fourth plant in Chennai. The Indo-German JV, which is the market leader in the weatherstrip business, also has manufacturing plants in Mumbai, Daman and Ahmedabad. 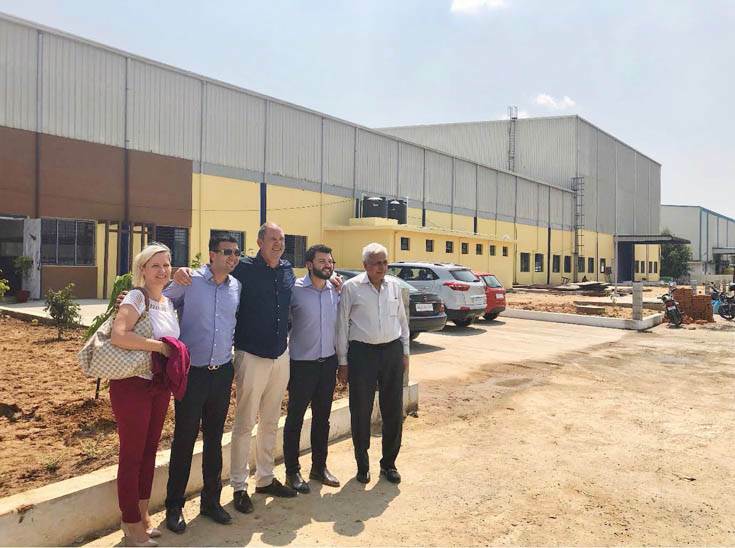 SaarGummi MD Michael Lorig (centre) with Ms. Nadine Jost, director, SaarGummi, along with Gold Seal- SaarGummi managing director Urvaksh Aga, Darius Aga and Dr Sudhir Kapur, at the upcoming Chennai plant site. Gold Seal-SaarGummi has a manufacturing capacity of over 35 million metres per annum of weatherstrips, door seals, window channels and windscreen rubber finishers supplied to OEMs like Mahindra & Mahindra, Ford India, Volkswagen India, Tata Motors, Force Motors, Bajaj Auto, Ashok Leyland, John Deere and others in India and also to over 23 export locations. Gold Seal-SaarGummi India is renowned for its innovation and design of EPDM rubber extruded sealing profiles and weatherstrips. The new Chennai plant, which is slated to go on stream in January 2019, is fully ready and equipped to manufacture the latest innovative profiles for the new OEM customers in the South namely Hyundai Motor India, Ashok Leyland and TAFE amongst others.